We review the new Days of Wonder board game Relic Runners. 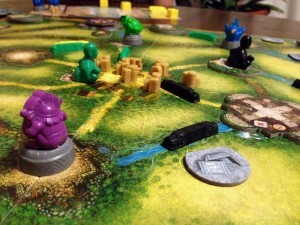 Read all of our thoughts on this route building and exploration board game. If you are looking for a light-medium eurogame, this could fit the bill for you. I feel like it’s been a while since Days of Wonder released a brand new board game. I know they’ve released plenty of Ticket to Ride and Memoir ’44 expansions, but I don’t recall the last time they released something completely new. With that in mind, I was happy to find out that they did indeed have something new planned for 2013, Relic Runners. Relic Runners puts players in the role of jungle explorers trying to loot ancient temples and ruins. I’ve come to expect a lot from Days of Wonders games over the years. So my big question was if Relic Runners is a worthy edition to the already stellar lineup of games from Days of Wonder or if this one be considered an “also ran.” Lets find out! Relic Runners is a route building and exploration game for 2-5 players that plays in about 45-60 minutes. Relic Runners plays best with any number of players. The board is a series of interconnected paths that players will be zipping around. In Relic Runners, each player takes on the role of an archaeologist hunting for lost relics among the ancient temples and ruins. 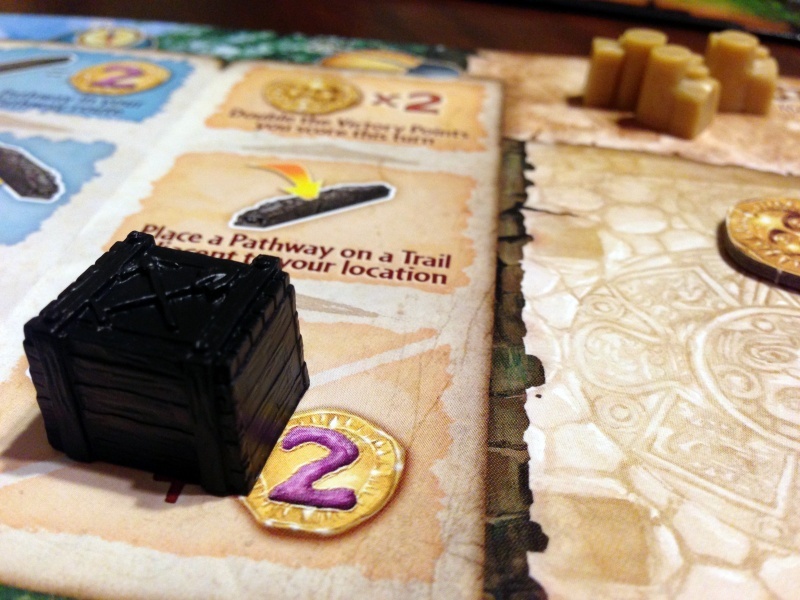 During the game, players must navigate different paths throughout the board to reach and explore these temples. Movement will be restricted until players start building a network of paths to make travel quicker. Players must also manage their ration supply as they are required to explore the temples. As players uncover the hidden secrets in these temples, they will gain victory points and in-game bonuses until they finally start uncovering the coveted relics. Collecting relics will require forward planning by the players but yield a large amount of victory points when collected. After a set number of relics have been collected, the game ends and the player with the most victory points is the winner. 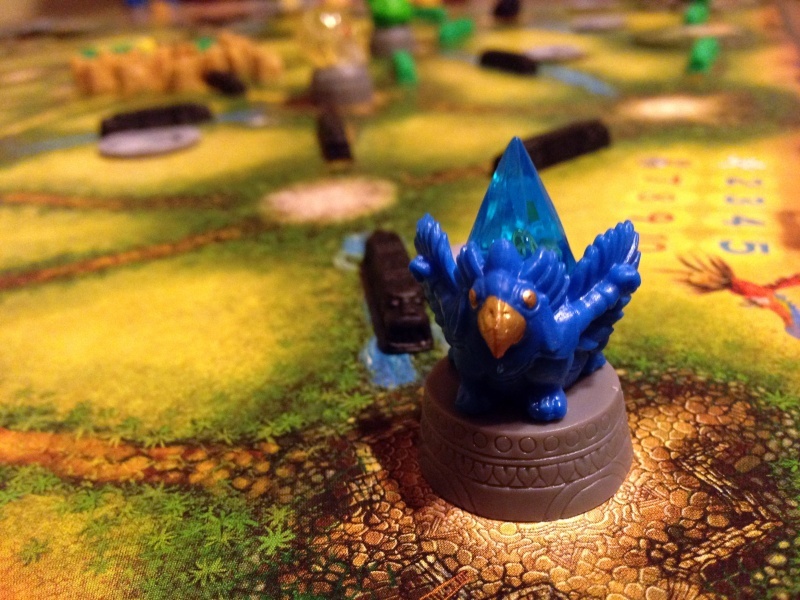 It’s safe to say that Days of Wonder has consistently given a lot of love to the components in their games. I honestly can’t think of a single one of their games where I’ve been disappointed with what came in the box. So I had some pretty high expectations for Relic Runners. The player mat in Relic Runners houses all their items and also the 3 “tech trees”. Well not only did Days of Wonder meet my expectations with Relic Runners, they smashed them cleanly to bits with a sledge hammer. All I can say is wow, what you get in the box just looks fantastic. Each player gets their own set of colored components ranging from plastic trail paths to toolboxes to a miniature explorer who almost looks like he’s half buried in quicksand, oddly enough. But what is going to get your attention the most is the awesome relic pieces. There are four different relics, each made out of colored plastic and translucent plastic. These look just phenomenal and really help to kick the component quality up a notch. Each one is uniquely sculpted and very thematic. In addition to all that plastic, you get a number of standard cardboard tokens. My favorite of which are the temples (which come in 4 different colors). Each temple has 3 different levels that stack perfectly to look like a top down view of an ancient ruin. My only gripe with the components is that the plastic tray insert wasn’t made to fit all the temple pieces for some reason. A few will overflow and I ended up just bagging those separately. Nothing Earth shattering, but a minor annoyance. Overall though, high marks to Days of Wonder for putting out a fantastic looking game. OK, that’s enough gushing over the bits and boards. Lets look at how this pile of cardboard and plastic plays. The board is setup by randomly placing the temples and ruins on locations around the board. The base camp in the center is where the players start and also where the extra rations are kept. One player goes first and the rest take turns in a clockwise manner. Each player can start the game with a unique special ability. Alternatively, if players are learning the game, they can use the other side of the mat that omits these powers. 1. 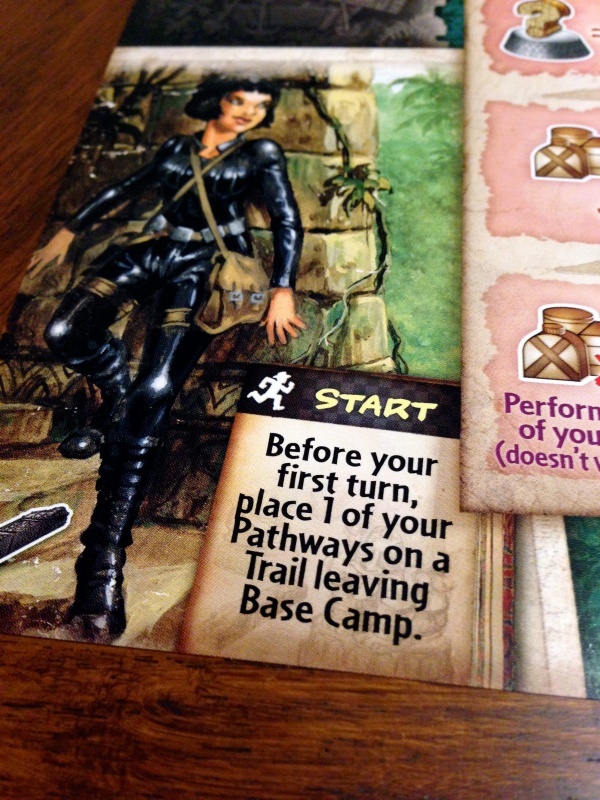 Move: A player must move their archaeologist. To move, a player moves their figure along one adjacent pathway to a temple or ruin. If they have laid out pathways of their own on previous turns, they can use those to extend their move. But they can only use their own pathways (not other players) and the pathways must be used at the start or end of their movement. Not both. Blue Temple: These give a player secret victory points that are only known to that player and revealed at the end of the game. Purple Temple: These give a player an immediate effect, such as collecting victory points or moving his tool box on the tool track. The top tile of the purple temples are always face up. Ivory Temple: Ivory temples will give a player either a permanent bonus, a one-time-use bonus or end game bonus depending on the level of the temple explored. Ruin: Ruins allow a player to place a pathway on a path adjacent to their location. This is the main way to get paths on the board. Paths are very helpful and almost necessary for relic runs. Speaking of relic runs, once the last tile of a temple or ruin has been explored, a relic is placed on the empty location (matching the color of the temple/ruin). To collect this relic, a player must start on a location with a relic and end their move on a relic of the same color in a different location. If they can do that, they collect the relic where they ended their move and gain victory points each to twice the number of paths it took to get there. Relic runs can be quite lucrative for the players and usually require forward planning because rarely can you get one without using some paths you’ve laid out on previous turns. Finally, each player gets a set of tool boxes. 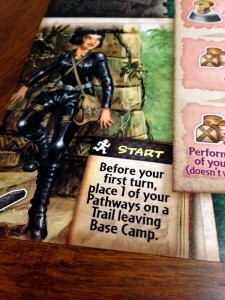 Throughout the game, as players are moving along the paths, they will pass a toolbox token. When they do, the flip that token over and move one of their tool boxes up on its progression chart. There are 3 different charts for a player to advance on and each chart has a different theme. The machete helps a player explore and resupply, the compass makes travel easier and the shovel provides extra actions or bonuses. All are good and once you use a bonus, your tool box marker resets to the bottom. 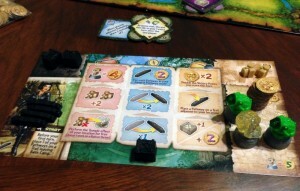 Once a number of relics have been collected, based on the number of players, the game ends with each player getting one more turn (except for the player that collected the final relic). At this point, any end-of-game scoring bonuses are applied and the player with the most victory points is the winner. The thematic relic tokens in Relic Runners look absolutely fantastic, and you get a lot of them! I wasn’t sure what to expect when I sat down to play Relic Runners. I haven’t played a new Day of Wonder title in a long time and the pathways in Relic Runners made me think of Ticket to Ride. Mind you I think Ticket to Ride is a great game, I just got burned out on it a long time ago. Well I was happy to find out that Relic Runners easily stands on its own legs as a fantastic medium weight game (or possibly at the very end of the light spectrum). First, the game is really easy to get started playing. Learning the rules took next to no time (the rule book is about 5 pages of actual rules) which made teaching it very easy. The game boils down to move your figure, then explore. Less you think that’s all there is to Relic Runners, along the way there are also a whole bunch of rule breaking bonuses players get to help give the game depth. The nice thing about Relic Runners is that the more complicated mechanic of the game, relic runs, doesn’t even come into play for the first part of the game. This means you don’t have to explain that mechanic until people have a good grasp of the basics of the game after a few rounds of play. That can be helpful when playing with people who tune out after a few minutes of rules explanation. 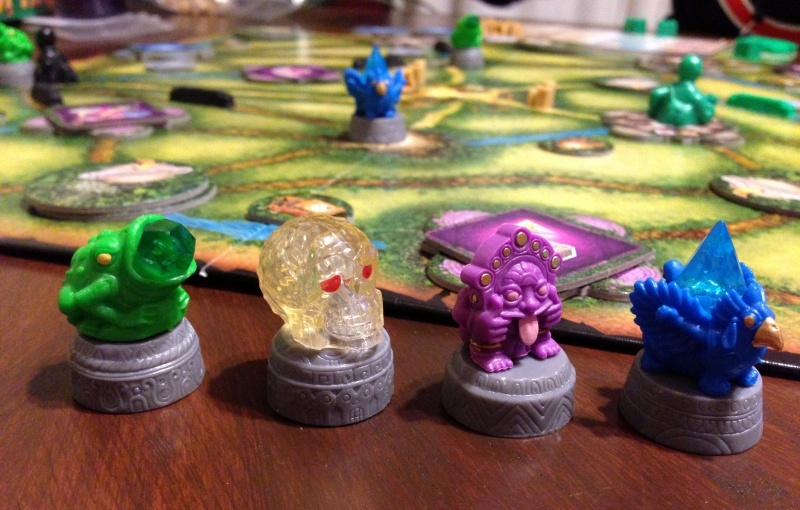 These easy-to-learn rules help make Relic Runners very accessible. I feel that this is a game that can easily be enjoyed with both gamers and non-gamers alike. While I think Ticket to Ride will probably be easier for a non-gamer to pick up, I don’t think they’d have to much trouble with Relic Runners. As the game can be played in 45-60 minutes, it also hits that sweet spot for a game that’s light enough when you are in the mood, but clearly not a filler game. In fact, the quick play time usually causes us to play a couple of times in a row. Players must decide when the best time to use their tool boxes are. 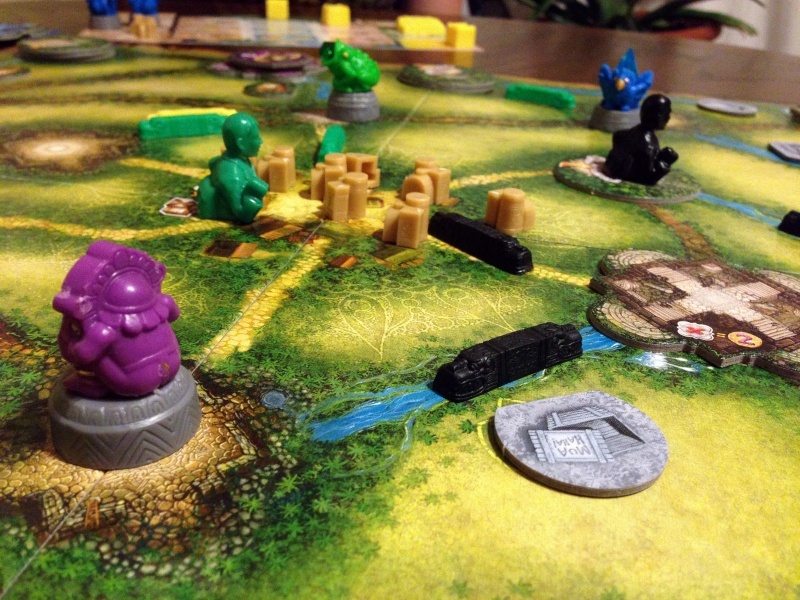 Even with the easy-to-learn rules, Relic Runners has a surprising amount of strategy and depth. There are many hard decisions to make during the game. You have to plan out your routes carefully so you don’t end up stranded far from base camp with no rations. Nothing is worse than wasting a turn moving and doing nothing because you stranded yourself. Players also need to decide when and how to use their limited tool boxes. Moving them up on the progression tracks can be slow going and it’s sometimes hard to decide if you want to use your toolbox now or save it for the higher value spaces later. Players will also have to decide if even exploring a temple is the right thing to do. When you take that last temple tile off the board, a relic is placed in the empty space. If your opponent is sitting on a like colored relic and has pathways to the spot your on, you just handed them an gift wrapped relic run. Decisions like this will dominate your thought process as you try and formulate the best strategy to win. Another good thing about Relic Runners is that there are many paths to victory (pun intended). Some people will try and horde the blue VP providing temples, while others might try and do as many relic runs as possible. Still, others might concentrate on getting their toolboxes to the top level and using the victory point providing abilities that lie there. In one game I achieved almost half of my total score by using a well placed toolbox on a long relic run. I have played Relic Runners a number of times so far and have had every game play out differently. Relic Runners is a game that also has no issues scaling for its different player counts. While not every game can make this claim, I’m happy to report that Relic Runners plays great with 2 players and with the higher counts as well. I’ve also noticed that it does play a little different from one end of the spectrum to the other. The 2 player game is somewhat more causal and less cut throat. Each player could be mostly contained to one half of the board if they want. There are just more spaces on the board so less fighting has to occur. At the higher player counts, the board will start getting more crowded and competition will be fierce to get those relics. My favorite range is probably with 3-4 players. The turns still go by quick enough to limit downtime, but competition stays very high. Honestly though, I don’t have a whole lot to complain about with Relic Runners. I think the game is just a ton of fun to play and we haven’t really run into any issues during our games. If I had to pick something, sometimes I wish the games would go a bit longer. If you have a great network of trails in place, it can be disappointing to have the game end so abruptly when you have all your cogs in place. But that is the most minor of complaints that shouldn’t deter anyone from trying this game out. Pathways to the relics are going to be the lifeblood of the game for you. Careful planning is very helpful. If you haven’t figured it out by now, I really enjoyed Relic Runners. I honestly don’t have a lot of bad things to say about this game and it’s going to have a permanent place in my game collection. Yes, it’s not the deepest game in the world, but it doesn’t have to be. 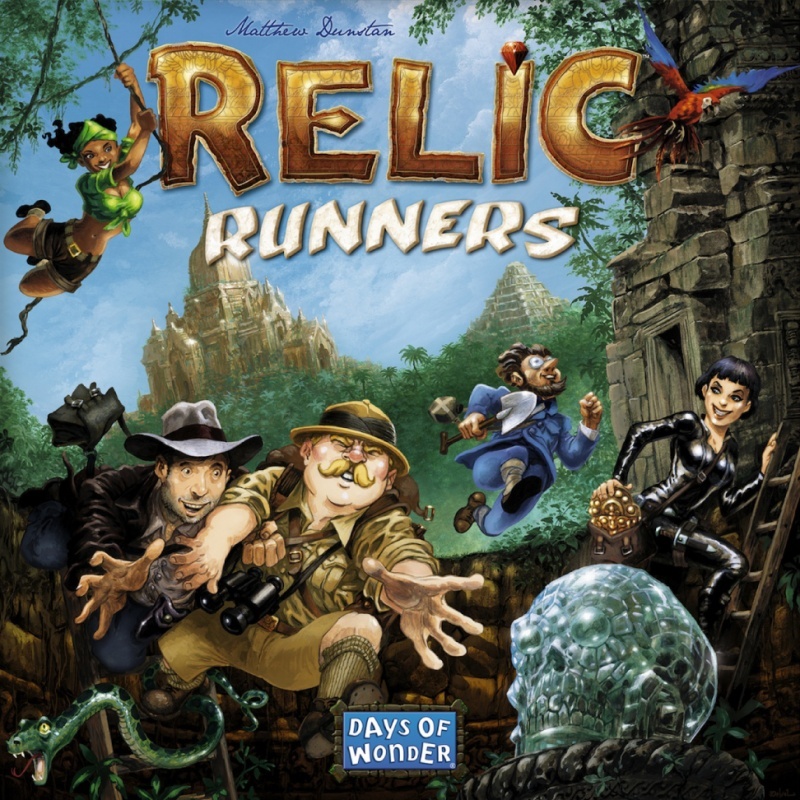 It plays in about an hour or less and if you are looking for a light-medium weight euro game, Relic Runners fits the bill perfectly. Days of Wonder ended up taking a great theme and built a game around it that’s a lot of fun. I enjoy building out my paths and I love the “what’s behind the door” aspect of the various temples. As you won’t use every temple token in a game, Relic Runners has a good amount of replay value and will also keep players on their toes during the game. You just never know what temple token will turn up as you explore (except the purple ones of course). If you’ve grown bored with Ticket to Ride or just want to try a new game with some amazing components, then give Relic Runners a try today. I think it’s safe to say that Days of Wonder has another hit on their hands. 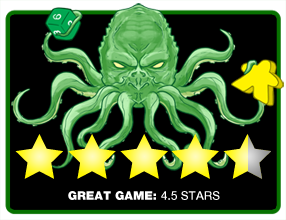 Final Score: 4.5 Stars – A fun, quick playing, medium weight eurogame with some amazing components. A few years ago, DoW did have an all new game, Cargo Noir. It was a huge bomb, however. I do recall Cargo Noir, that one kind of faded into the background of the DoW catalog of games. I haven’t heard much about it in a long time so I’m guessing it wasn’t a hit.